Although the street food sector plays an important role in urban food security, state-led food security measures in India have failed to provide a role for poor urban street food vendors to engage in the distribution and consumption of healthy foods. Instead, state-led food security schemes, whether production, distribution, or consumption oriented, have viewed the urban poor simply as beneficiaries of subsidized grain. This case study illustrates how the street food sector, operated by poor urban vendors selling ready-to-eat, healthy millet-based porridges in Madurai, has improved access to nutritious foods and created livelihood opportunities for the urban poor. The paper provides an overview of the informal street food sector, socioeconomic conditions of vendors, gender-based division of labour, as well as the food preferences and health awareness of consumers. Analysis of the data indicates the marginalization of street food vendors under the existing policy environment in urban India. The paper discusses how the state, as a regulatory body and a service delivery agent, as well as research and development organizations can strengthen the rights and capabilities of street vendors and, in doing so, improve urban food security. The research for this paper was supported under the CIFSRF (Canadian International Food Security Research Fund) grant received from the International Development Research Center (IDRC) and Canadian International Development Agency (CIDA), Ottawa. The authors greatly appreciate the intellectual input and logistical support provided by M. Karthikeyan, M. Palanisamy, Dr Damodar Jena, A. Madhankumar, Nivetha Mohan, N. Suji and other colleagues from DHAN Foundation, Madurai, India. We would like to recognise the language translation and other assistance provided in the field research by Esther Parameswari, Anwar Khan and B Gerard from Madurai. 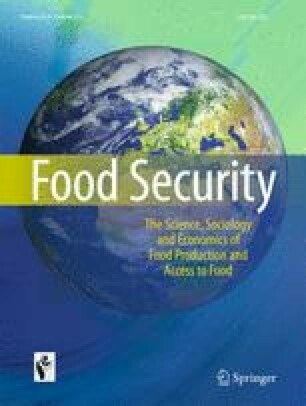 Finally, we also acknowledge the helpful insights and critiques provided by anonymous reviewers and editors of Food Security. Agricultural Marketing Information Network (2014). Statistical and Analytical Reports. http://agmarkweb.dacnet.nic.in/sa_reports_menu.aspx. Accessed 16 Sept 2014. Devi, P. B., Vijayabharathi, R., Sathyabama, S., Malleshi, N. G., & Priyadarisini, V. B. (2011). Health benefits of finger millet (Eleusine coracana L.) polyphenols and dietary fiber: a review. Journal of Food Science and Technology, doi: 10.1007/s13197-011-0584-9. FAO (2013). Food security indicators. http://www.fao.org/economic/ess/ess-fs/ess-fadata/en/#.VBHAI_ldV2G. Accessed 10 Sept 2014. Foliot, G. (2011). Cash & Vouchers: When Food is Available but Economically Inaccessible. http://www.wfp.org/aid-professionals/blog/cash-vouchers-when-food-available-economically-inaccessible. Accessed 27 August 2013. Ministry of Law and Justice (2013). The National Food Security Act, 2013. http://indiacode.nic.in/acts-inpdf/202013.pdf. Accessed 23 Sept 2014. Ministry of Law and Justice (2014). The Street Vendors (Protection of Livelihood and Regulation of Street Vending) Act, 2014. http://www.indiacode.nic.in/acts2014/7%20of%202014.pdf. Accessed 23 Sept 2014. Nadar, A. G. (2013). Jayalalithaa’s one-rupee ‘idli sambar’ a hit in Chennai. http://www.rediff.com/news/slide-show/slide-show-1-jayalalithaa-s-one-rupee-idli-sambar-a-hit-in-chennai/20130322.htm. Accessed 14 August 2013.